Anyone who is a part of the business world will tell you that it is their dream to become successful. Stress and pressure is part and parcel of the business world. Those who are unable to deal with pressure should not join the business world. This having been said, not everyone who does join the business world is able to deal with pressure in a proper manner. It is something which is acquired over time. 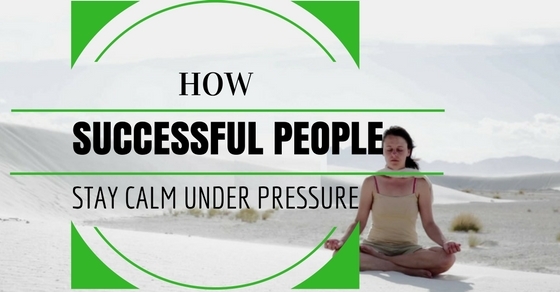 You might be wondering how do successful people stay calm under pressure? It is not because they are super human. How High-Profile Professionals Stay Calm Under Pressure? One of the main things which successful people do when they are under pressure is that they have faith in themselves. Irrespective of how bad things are or how difficult things keep, they keep telling themselves that they have it in them to recover from the situation. Believe it or not this faith is what sees them through in their life. Things may never be easy for them, but they do their best to keep things moving. If the boss fails to be positive, the entire company is going to crumble and fall apart. It is often said that faith can move mountains and that is what successful people live by. Irrespective of what others might be telling them, successful people only follow their own heart. Even if others constantly tell them that something is impossible, they just turn a deaf ear to what others are saying. In order to be successful and deal with the pressure, such successful individuals think that it is best to turn a deaf ear to what others are saying. Most often, such individuals are not even concerned if you do well or not, they are simply jealous of all that you have achieved and they are dying for you to fail at a given task. The faster you acknowledge this the better things will be for you. To keep calm under pressure, successful people simply rely on their experience to see them through. Those who have experience on their side are able to do things which youngsters will never have the guts to do. Such individuals have probably faced such situations in the past and that is exactly why they know exactly what to do when things go wrong. Rather than having to start at rock bottom again they simply apply the same principles which they have watched their own seniors do in the past. It is for this reason that many companies prefer to hire those individuals who have experience on their side, rather than having to hire freshers. In order to work properly and become successful in the first place an individuals must learn to maintain a proper work life balance. Once individuals fail to maintain a proper work life balance that invariably affects their personal as well as professional life. Maintaining a proper work life balance means giving equal importance to every aspect of your life, rather than blindly focusing on your job and career. Focusing on your career is very important indeed yet it should not be the be all and end all of life. Without money surviving becomes not merely difficult but also rather impossible. No all of us have it in us to be very strong mentally. Successful individuals manage to stay calm under pressure because they are very strong mentally. Once they have made up their minds to do something they ensure that they get it done. Inner strength is something which is acquired over time. If a person is mentally strong that is bound to help him gain success on a career front as well. Fearlessness is something which is required especially if you have big career goals and desire to come out first in this rat race called life. In order to survive under pressure it is important to be fit and fine. If you are not physically able you are bound to get tense with even the smallest of things. Successful people balance their lifestyle out very well and they make it a point to work out on a daily basis. Even if they are unable to work out on a daily basis they do try their best to work out every alternate day. Exercising has not merely one, but innumerable benefits, which are likely to help not only office going individuals, but young and old people as well. Along with taking the time to work out, successful people also do meditation. Meditating for even 5-10 minutes reaps so many benefits. If you do not have time to go for a class all you need to do is turn on your computer and listen to soothing music which will immediately make you feel better. You need not even meditate at home, some successful individuals have gentle music playing in their office all the day long and that is something which helps them a great deal when they are under some kind of pressure. To make it big in any career it is of paramount importance that you love your job and are dedicated to it even when the going gets tough. It is rather unfortunate that many people hate their jobs and only take up a career because it is what their parents want them to do. Successful people love their jobs and even if they are at their workplace for a number of hours it does not feel like a burden to them for even one second. A brilliant way to stay calm under pressure is simply choosing to do a job which you are generally interested in. There are different kinds of individuals in the world. Some people love challenges where as on the other end of things there are those individuals who simply detest challenges. For most successful people challenge is something which they feel brings out the best in time. If you too would like to be calm under pressure like successful people, it is very important that you learn to love challenges. Even if a situation is pressurizing, you should face it in a head on manner so that after you come out successful you will surely have a renewed energy and confidence. Successful individuals are those who have already managed to make a proper mark in the business world. Such individuals are well aware of the fact that when they deal with such pressuring situations, they do not have much to lose owing to the fact that they have already been able to establish themselves too much. Rather than feeling scared such successful individuals appreciate what they have and do not take on any unnecessary risk. They know when to say no and easily pass on a situation which they know would prove to be problematic for them. Successful individuals are those who have a lot of theoretical knowledge. Their knowledge is not wishy washy, on the contrary it is very sound. Whenever any adverse situation presents itself, they have an exact action plan to deal with the pressurizing situation. Successful individuals do not simply stop trying to learn new things, they constantly try their best to gain more and more knowledge so that when a problem happens to arise they do not crumble under the pressure, on the contrary they rise to the occasion with a great deal of grace and technique. A major thing which helps successful people be calm under pressure is that they have full confidence in not merely themselves, but also in the work force which they have hired. Big companies usually make it a point to hire only the best of the best and it is for this reason that they do not fret under the weight of a challenging situation. Successful individuals that run big companies, rely heavily on their work force. When things get tough they simply delegate the work to their best men and women and leave it up to them to get the issue ironed out. As mentioned above, when under pressure, successful people make it a point to listen to only what their own mind is telling them. In addition to that they make it a point to follow their own instincts. Very often successful people do things based on a gut feeling. So over time successful individuals learn to trust their gut and whenever they have a right feeling about something they simply go with the flow and act in a way which they feel right. Such individuals are very ethical and they are never under pressure, simply because they never indulge in illegal activity. Whenever a stressful situation presents itself, less capable individuals usually find themselves under a great deal of pressure. On the contrary successful people are able to take a series of swift decisions which enable them to get out of a tricky situation as soon as possible. Being this way is very good as it helps to get rid of a problematic situation rather quickly. People who take too long to take any action are those the ones who get themselves as well as others into a lot of problems. Successful individuals have not become successful without reason. Successful people are known to be people who have the ability to think on their feet. This having been said, they never just give an answer from the top of their hat. As mentioned above successful people are able to take to quick decisions on the go, yet in addition to that they manage to stay calm under pressure, simply because they never over think things. They never let decisions of the past affect their future. It is very important that in life, you do not let your past affect your future as you will never be able to go very far at that rate. Maintaining a healthy diet is something which is very important indeed. If you fail to have a healthy diet then you will never be able to be strong enough to brave all the problems that happen to serve as obstacles in your path to success. No matter how busy successful people are in their work place they ensure that they take the time out to eat a proper and balanced meal. Many people think that they are showing immense dedication to the company when they skip meals or skip their lunch breaks, but doing this is something which is very stupid indeed. A balance diet gives you the energy to deal with pressurizing situations. These are some of the main ways how successful people manage to stay calm when adverse situations present themselves. Pressure is something we have to deal with on a daily basis, not merely in the work place but also at home. So the faster you learn to deal with pressure the better it will be for you. You might not be able to implement all these things, but you should try and do as many things as you can if you wish to stay happy in life. Regardless of what others have to say, you should live life on your own terms so that you do not regret it in time to come.